This is the ninth in a series of blog posts discussing major figures in film and literature, based on the Major Arcana of the Tarot. I'll be using the 21 Major Arcana of the standard Rider-Waite-Smith Tarot deck. For some more background on the deck's history and its elusive role in popular culture, see this post from HiLowBrow, which is a good primer on the Tarot, and pretty fascinating in its own right. I haven't read Steinbeck's whole bibliography, but even among those I have read, I only really need to cite one of his novels -- and a lesser one, at that -- to assign him to the Strength card. This is his 1937 novel of friendship and loyalty among migrant American workers, Of Mice and Men. Not that the rest of Steinbeck's work doesn't fit. His preoccupation with male loyalty and bonding, his repeated use of traveling workers as his milieu... there is a certain quiet strength to all of his work. Strength, the tarot card, is not simply about power, after all. It contrasts sharply with the previous card, The Chariot, in that the Chariot represents a warrior's brashness and posturing. Strength is more about harmony of body and spirit, the physical strength of the lion being tamed by -- and reflected in -- the patience and spiritual strength of the handler. Steinbeck's view of the American experience is that it is built upon hardship, independence, loyalty, patience, and sacrifice. He was well-known as a New Deal progressive who had issues with capitalism and harbored sympathy for the laboring class. At the same time, Steinbeck's feet were firmly planted in demonstrative masculinity, almost to the point of chauvinism. His sensitivity toward minorities -- as shown with Lee, the Chinese servant in East of Eden -- was not necessarily echoed in his attitude towards women. Too often, his female characters turned out to be sirens or harpies, with the true dramatic relationships always playing out between his male characters. Nonetheless, it is the compassionate, patient image of Strength which prevails as a virtue in Steinbeck's writing. Males may be overwhelmingly dominant, but their masculinity is not violent, nor mired in a simpleton's Manicheanism. 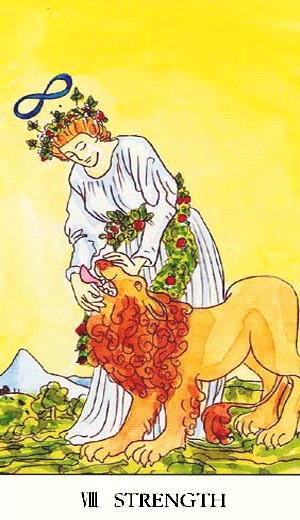 Of Mice and Men maps neatly to the Strength tarot card: Lenny is the lion, a loving, naive physical specimen of power and innocent impulse, Strength in its most literal form. George takes on the symbolic role, the image of Strength as loyalty, self-sacrifice, and service to family and community. The finale of the tragic story is George's final, irreversible taming of the lion. In the Tarot, Strength is part of a triad of virtues, along with Temperance and Justice. 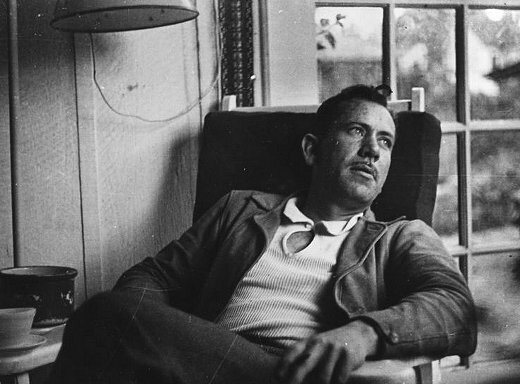 Steinbeck takes his place as Strength, the first of the three, and the only writer among the three representatives. His Strength is the loyalty and compassion, which, situated as it is in the imperfect world, must sometimes act against its own strongest convictions to bring the world back into balance.